Where oh where do the days go? Well, I think one day is running into another for me lately because they all seem the same. It has snowed here in Kansas and the fluffy white stuff has kept me indoors looking out! Brrrrr! (:>) This is the second largest snow here in our neck of the woods. We got over 14 inches on Wednesday and a little bit on Thursday. It is beautiful and we sure did need the moisture! 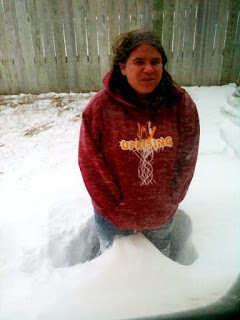 This is my granddaughter Bailey standing in a snow drift. I have been spending the time inside reading my Bible. I am trying to read it through in 40 days for Lent. And may I say I am really enjoying it! I have read it through many times over the years at a slower pace...but it is always good to do a quick refresher...and to be reminded of the great power of our God! 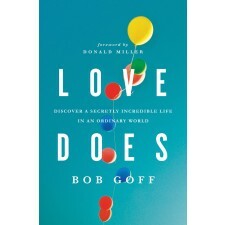 I am also reading a book called..."Love Does"...by Bob Goff. This book is a good reminder to put our love into action!!! To put feet to our prayers and to our faith! (Because Faith without works is dead!) It has some fun stories about reaching out to others more, and it shows us the results of doing that. I get warm fuzzies just reading this book...and it is greatly challenging me too. Click Here for info on the book. My husband has been getting some inside projects done since it snowed too...so we are not just sitting here moping because we can't get out and go somewhere. (:>) The roads are clearing now...but it is really cold out. And more snow is coming on Sunday night and Monday. How are you on this Saturday? And what is the weather like..."In your neck of the woods" today? Click on the button below and share your six words! We will be getting that storm you are expecting tonight and tomorrow. It sounds like you are putting your inside time to good use. I would be well past being grateful with that level of snow, Linda. We had a surprise covering this morning but it had gone by the time I slithered down the road to zumba and back. That's a whole lot of snow!! Oh Linda, I am soooo glad that you asked. I am just fine and our weather is fine, temps to be in low 70's today. I've been playing golf all winter long except for travel and a bit of surgery. This morning I took a widower, Claude, to the eye doctor and haven't been home so very long. He and his lovely wife were in our Sunday school class. Now just him as his wife died last year. And like me, Claude has sold his pick up truck. A Texas man loses some of his manhood when he sells his truck. Good News (pun??) about your reading the Bible for Lent. We got some snow, more coming this week. The book sounds good. I am really working on being a "better" me. Inside projects certainly help to pass the time! I've only read through the Bible once before. How awesome is it that you've done it several times! oh my-lovely and loving post. have a wonderful and peaceful Sunday. I feel the same way about how quickly the weeks pass. It's hard to believe sometimes. I enjoy your blog! Up here in Maine we're suppose to have it tomorrow through Monday. It is a great feeling to get projects done when the weather prevents outside activities. Keep snugly warm though. Thank you for the visit. Yeah, you guys in the Midwest really got slammed! He got a couple of feet here in Utah, too! Love the photo of your granddaughter, it shows the amount of snow!! Cold and windy. Well, it was cold for coastal Mississippi at 42 F mid-morning with forecasts of 31 for Sunday morning. Bible study is great, but my first read through the Bible in a year as a young mom was my first real inkling of the unchanging character of God. At about the second or third month I realized that Scripture that seemed to jump out at me was exactly what I needed for situations I encountered a week later. What a blessing! Don't know if I could make it through in 40 days though. You Are Loved... Yes You Are!!! !